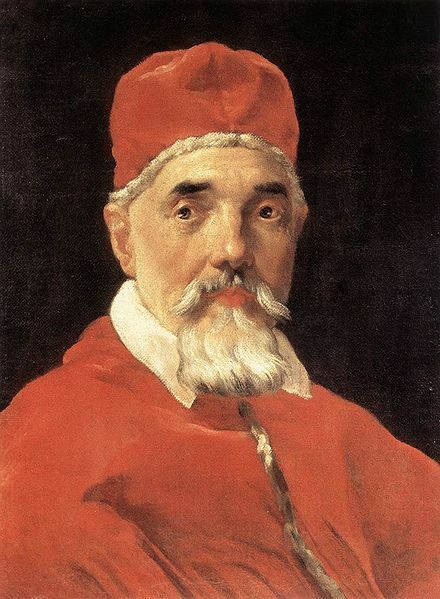 Pope Urban VIII (baptised 5 April 1568 – 29 July, 1644), born Maffeo Barberini, was pope from 1623 to 1644. He was the last pope to expand the papal territory by force of arms, and was a prominent patron of the arts and reformer of Church missions. However, the massive debts incurred during his papacy greatly weakened his successors, who were unable to maintain the papacy's longstanding political and military influence in Europe. He was also involved in a controversy with Galileo and his theory on heliocentrism during his reign. Urban VIII issued a 1624 papal bull that made smoking tobacco punishable by excommunication, because he believed it led to sneezing which too closely resembled sexual ecstasy. Pope Benedict XIII would later repeal the ban. Maffeo Barberini, born at Florence in April, 1568; elected pope, 6 August, 1623; died at Rome, 29 July, 1644. His father Antonio Barberini, a Florentine nobleman, who died when Maffeo was only three years old, his mother, Camilla Barbadoro, brought him to Rome at an early age. He lived with his uncle, Francesco Barberini, who was then prothonotary Apostolic, and was educated at the Collegio Romano under the direction of the Jesuits. In 1589 he graduated from Pisa as Doctor of Laws, and returning to Rome he became abbreviator Apostolic and referendary of the Segnatura di Giustizia. In 1592 Clement VIII made him Governor of Fano, then prothonotary Apostolic, and in 1601 papal legate to France to present his felicitations to King Henry IV on the birth of the dauphin, the future King Louis XIII. In 1604 he was appointed Archbishop of Nazareth and sent as nuncio to Paris, where he became very influential with Henry IV. In recognition of his services in France, Paul V created him cardinal-priest, 11 September, 1606, with the titular Church of S. Pietro in Montorio, which he exchanged for that of S. Onofrio, 5 September, 1610. On 17 October, 1608, he was transferred to the See of Spoleto, where he convened a synod, completed the seminary, and built two other diocesan seminaries, at Spello and Visso. In 1617 Paul V made him legate of Bologna and prefect of the Segnatura di Giustizia. On 19 July, 1623, fifty-five cardinals entered conclave to elect a successor to Gregory XV; on 6 August Cardinal Maffeo Barberini received fifty votes. The new pope took the name of Urban VIII. Being attacked by the fever which was raging in Rome, he was obliged to postpone his coronation until 29 September. It is related that, before allowing himself to be vested in the pontifical robes, he prostrated himself before the altar, praying that God might let him die if his pontificate would not be for the good of the Church. Josaphat Kuncevyc, 16 May, 1643. He reserved the beatification of saints to the Holy See and in a Bull, dated 30 October, 1625, forbade the representation with the halo of sanctity of persons not beatified or canonized, the placing of lamps, tablets, etc., before their sepulchres, and the printing of their alleged miracles or revelations. In a later Bull, dated 13 September, 1642, he reduced the number of holy days of obligation to thirty-four, besides Sundays. Urban introduced many new offices into the Breviary. He composed the whole proper Office of St. Elizabeth and wrote the hymns, as they are in the Breviary, for the feasts of St. Martina, St. Hermenegild, and St. Elizabeth of Portugal. A book of poems, written by him before he became pope, was published during his pontificate under the title: "Maphei Cardinalis Barberini poemata" (Rome, 1637). In 1629 he appointed a committee for the reform of the Breviary. Their incomplete and often ill-advised corrections were approved by Urban, 19 September, 1631, and embodied in the official edition of the Roman Breviary which was issued the following year (see BREVIARY — Reforms of the Breviary). In 1627 Urban gave the final shape to the celebrated Bull, "In Coena Domini." In 1634 he enjoined upon all ruling bishops, including cardinals, to observe the episcopal residence as decreed at the Council of Trent. During Urban's pontificate occurred the second trial and condemnation of Galileo by the Roman Inquisition. On 6 March, 1642, he issued the Bull, "In eminenti," condemning the "Augustinus" of Jansenius. Urban was a great patron of Catholic foreign missions. He erected various dioceses and vicariates in pagan countries and encouraged the missionaries by word and financial assistance. He extended the sphere of activity for the Congregation of Propaganda, and in 1627 founded the Collegium Urbanum, whose object was the training of missionaries for foreign countries. For the Maronites he had already founded (1625) a college on Mount Lebanon. In order to increase the number of missionaries in China and Japan he opened these two countries to all missionaries in 1633, although Gregory XIII had given the Jesuits the exclusive right to those missions in 1585. In a Bull, dated 22 April, 1639, he strictly prohibited slavery of any kind among the Indians of Paraguay, Brazil, and the entire West Indies. In his efforts to restore Catholicism in England Urban had little success. In 1624 he sent Richard Smith as vicar Apostolic to that country, but the latter's imprudent insistence on exercising full episcopal authority in England and Scotland brought him into public conflict with the Jesuits and other missionaries of religious orders. The Government issued new hostile measures against the Catholics, and in 1631 Smith was obliged to flee. Three years later Urban sent Gregorio Panzani to England. Having gained greater liberty for the Catholics, he was succeeded in 1638 by George Conn, an Englishman, who had previously been secretary to Cardinal Francesco Barberini. Forced to return to Rome in 1639, on account of ill-health, he was replaced by Rossetti. Repeated requests made through him to the pope for financial aid in the war brewing between the king and Parliament were refused by Urban except on condition of the king's conversion. The ensuing war put an end to all negotiations. (See the letters of Panzani, Conn, and Rossetti to Cardinal Barberini in the Record Office Transcripts.) The religious orders found a zealous promoter in Urban. In 1628 he approved the Congregation of Our Saviour, a reformed branch of Augustinian canons, founded by Peter Fourier in 1609, and in 1632, the Lazarists or Priests of the Mission, a secular congregation founded by Vincent of Paul. He also approved the following sisterhoods: Canonesses of the Holy Sepulchre, 1631; Sisters of the Incarnation, 1633; Nuns of Our Lady of Nancy, 1634; and Sisters of Our Lady of Mercy, 1642. The Jesuitesses, founded by the Englishwoman Mary Ward in 1609, he suppressed in 1631 for insubordination. Urban's greatest fault was his excessive nepotism. Three days after his coronation he created Francesco Barberini, his nephew, cardinal; in 1627 he made him librarian of the Vatican; and in 1632 vice-chancellor. Francesco did not abuse his power. He built the large Barberini Palace and founded the famous Barberini Library which was acquired and made part of the Vatican Library by Leo XIII in 1902. Urban's nephew, Antonio Barberini, the Younger, was created cardinal in 1627, became camerlengo in 1638, then commander-in-chief of the papal troops. He was legate at Avignon and Urbino in 1633; at Bologna, Ferrara, and Romagna in 1641. Urban's brother Antonio, who was a Capuchin, received the Diocese of Senigaglia in 1625, was created cardinal in 1628, and later appointed grand penitentiary and librarian of the Vatican. A third nephew of Urban, Taddeo Barberini, was made Prince of Palestrina and Prefect of Rome. It is scarcely credible what immense riches accrued to the Barberini family through Urban's nepotism. Finally, tormented with scruples concerning his nepotism, Urban twice appointed a special committee of theologians to investigate whether it was lawful for his nephews to retain their possessions, but each time the committee decided in favour of his nephews. Among the members of the second committee were Cardinal Lugo and Father Lupis. In the government of the Papal territory Urban, as a rule, followed his own judgment; even his nephews had little influence during the first ten years of his pontificate. He honoured the cardinals by ordering them to give precedence only to crowned heads, and in a Decree of 10 June, 1630, bestowed upon them the title of "Eminence," their former title having been "Illustrious and Most Reverend." In 1626 he extended the Papal territory by inducing the aged Duke Francesco Maria della Rovere to cede his Duchy of Urbino to the Church. Towards the end of his pontificate his nephews involved him in a useless war with Odoardo Farnese, the Duke of Parma, with whom they had quarrelled on questions of etiquette during his visit to Rome in 1639. In revenge they induced Urban to prohibit the exportation of grain from Castro to the Roman territory, thus depriving Farnese of an income without which he could not pay the interest on his monti, or bonds. The duke's creditors complained to the pope, who took forcible possession of Castro, 13 October, 1641, in order to assure the payment. This proved ineffective, and on 13 January, 1642, Urban excommunicated Farnese and deprived him of all his fiefs. Backed by Tuscany, Modena, and Venice, the duke set out towards Rome at the head of about 3000 horsemen, putting to flight the papal troops. Peace negotiations were concluded near Orvieto, but not accepted by the pope. In 1643 hostilities were renewed and continued without decisive success until the pope finally concluded a disgraceful peace on 31 March, 1644. He was obliged to free the duke from the ban and restore all the places taken by the papal troops. Urban spent heavy sums on armaments, fortifications, and structures of every kind. At Castelfranco he erected the costly but unfavourably situated Fort Urbano, established an extensive manufactory of arms at Tivoli, and transformed Civitavecchia into a military port. He strongly fortified the Castel of Sant' Angelo, Monte Cavallo, and built various fortifications on the right side of the Tiber in Rome. He erected the beautifully situated papal villa at Castle Gandolfo, founded the Vatican Seminary, built various churches and monasteries, beautified streets, piazzas, and fountains. The three bees in his escutcheon attract the attention of every observant visitor in Rome. In the Basilica of St. Peter he erected the baldachin over the high altar, the tomb of Countess Matilda, translating her remains from Mantua, and his own tomb, opposite that of Paul III. For some of these structures he used bronze from the roof of the Pantheon, thus causing the well-known but unwarranted pasquinade: "Quod non fecerunt Barbari, fecerunt Barberini." The pontificate of Urban extended over one of the most critical periods in the history of the Catholic Church, the Thirty Years War. Ranke and Gregorovius attribute Urban's actions in this war to his intention to humiliate the two Houses of Habsburg (Austria and Spain), whose too great power was a constant menace to Italy and Rome; hence, they declare, he favoured France and did not subsidize Emperor Ferdinand II in his war against Gustavus Adolphus and the Protestants. An unbiased study of the situation will lead to a different conclusion. Neither as pontiff not as temporal ruler could Urban remain a disinterested onlooker, and he had no other motive than the welfare of the Catholic Church. As the common Father of Christendom he interposed concerning the Valtellina, a strategically important valley between Venice and the Grisons, which was eagerly coveted by France as well as Spain. He refused to join the alliance which France had made with Venice and Savoy against Spain in 1624, and was instrumental in bringing about the Treaty of Monzon, 5 March, 1626, which gave equal rights upon the Valtellina to France and Spain. He also refused to enter the league which France had concluded with Venice and Savoy at the beginning of the war of the Mantuan succession in 1629. "It is impossible for me," he writes to Nagni, the French nuncio, 2 April, 1629, "to put in jeopardy the common fatherhood and, in consequence, to be no longer able to heal and pacify, which is the proper business of the pope as vicar of Christ" (Nunziatura di Francia, Vat. Lib. Cod. 71, and Nicoletti, III, 1451-58). Equally false are the accusations of Ranke and Gregorovius that Urban opposed the election of Ferdinand's oldest son as King of Rome and advocated the dismissal of Wallenstein as commander-in-chief of the imperial army through his nuncio at the Electoral Diet of Ratisbon in 1630. The first accusation was already branded as a calumny by Cardinal Francesco Barberini in a conference with the imperial ambassador Savelli on 16 March, 1629 (Nunziatura di Germania, Cod. 118, fol. 89); the second is refuted by Urban himself, who on 17 January, 1632, congratulated Wallenstein on his reassumption of the command and sent him the Apostolic blessing (Registrum brevium, XXXI, 87). It is, however, true that Urban did not subsidize the imperial army and the Catholic League as liberally as he could and should have done. Nevertheless, he sent (1632-34) two million francs out of his own means to the Catholic troops in Germany. Urban did not join the League of the Catholic Estates, which was planned by the emperor, as the League was directed not only against Gustavus Adolphus, but also against France; hence it could not be joined by the pope as the common father of Catholics. He urged Louis XIII and Richelieu to desist from subsidizing the King of Sweden, but refused to excommunicate them, as he feared a repetition of what had occurred in England under Henry VIII and Elizabeth (Nunziatura di Germania, Cod. 127, fol. 266). The greatest calumny that has been spread about Urban is his alleged sympathy with Gustavus Adolphus, whose death he is said to have mourned and for whose soul he is said to have celebrated a Requiem Mass. What Urban thought of the Swedish king and how he mourned his death is manifest from a Brief, addressed to Ferdinand on 14 December, 1632, when the pope received the news that Gustavus Adolphus had fallen in battle (16 November, 1632). The Brief is published in the original Latin by Ehses. The following quotation will suffice: "We give eternal thanks to the Lord of vengeance because he rendered retribution to the proud and shook from the neck of the Catholics their most bitter enemy." The Mass which he is said to have celebrated in the German National Church, the Anima, at Rome on 11 December, was in reality a Mass of thanksgiving, of which Alaleone, the papal master of ceremonies, says expressly: "This Mass was celebrated in thanksgiving upon receiving the message of the death of the King of Sweden" (Cod. Vat. 9252, II, 71 sq.). On the next day the "Te Deum" was sung in the Sistine Chapel in presence of the pope, "ob laetitiam necis regis Sueciae interfecti," after which the pope himself chanted the versicles and orations. It is as yet difficult to pass a correct judgment on Urban from every point of view. His life remains still to be written fairly. His private life was beyond all reproach, and the common welfare of the Church seems to have been the mainspring of his pontifical labours. His one fault was squandering money on his nephews, army, and fortifications, while stinting Ferdinand and the Catholic League in Germany. Maffeo Barberini was born in Florence in April, 1568, elected Pope Urban VIII on 6 August, 1623, and died at Rome, 29 July, 1644. He has a number of calls to fame, one being that he was involved with the Galileo affair. He also was an active pope who carried out a number of reforms of the Church, some good, some not so good. One of his less successful reforms was his reform of the Roman Breviary. Pope Urban VIII was an excellent classical Latinist and felt that the hymns of the Roman Breviary needed to be reshaped into classical models. He was by no means the first to feel this way, but he has the distinction of being the Pope who actually carried out such an extensive revision of the hymns of the Roman Breviary into classical models. While a committee was appointed for the task, it is clear that the Pope personally oversaw the revision. Urban VIII was not content to leave alone the works of such great Latin Hymnists such as Prudentius, Fortunatus, or even Ambrose, but instead molded their works and the works of others into classical forms. The revision of the hymn texts was approved by the Congregation of Rites on March 29, 1629 and on January 25, 1631, the revised Roman Breviary was authorized for publication. History and scholars have generally held that these revisions were very ill-advised. Indeed, those orders who were able to resist the revisions did so. Claiming the privilege of exemption granted by Pope Pius V because of the antiquity of their own Breviaries, the Dominicans, Benedictines, Cistercians, and Carthusians refused to adopt the revisions. Moreover, the revisions were never accepted at St. Peter's or the Lateran in Rome itself! This produced two distinct versions of the Latin hymnal that were to coexist for more than three hundred years. It was only until the recently that the mess was straightened out. Due to the widespread use and familiarity many have with Urban's revised hymns, I have tried to indicate his revisions as footnotes to the original text and thereby hopefully clear up some of the confusion that lingers today.